Please note that this is Eduard's new-tooled version of the Bf109G-F and contains Colour Zoom etch metal parts, Canopy/wheel mask, 6 different marking options (including a tropical filter fitted F, flown by the legendary Hans Joachim Marseille) as well as the plastic parts. 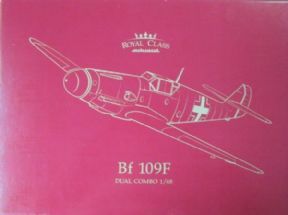 This is an extensive set where you get 2 plastic Bf109F kits in one box! There is canopy/wheel mask and Colour photo etch metal parts for each kit, plus markings for 14 different aircraft of the Luftwaffe, including ones flown by famous aces such as , Molders, Lutzow, Steinhoff, Nowotny, Bob, Bar and Bartels. There are also 2 full sets of resin wheels and exhausts. As a bonus the set also includes a Bf109 Lager glass and beermat.